Canadian Pacific is running a "Canada 150" train across (most of) Canada from west to east to commemorate Canada's 150th birthday year. This classic train has four "F" units on the head end - certainly a rarity in Canada! The train several of CP's Royal Canadian Pacific heavyweight cars and two special cars - the "Spirit of Tomorrow" car and a stage car for the show they put on at each stop. Naturally, I'd love to photograph this train. It'll be on display in Winnipeg on Friday, August 4th from 5 PM to 8 PM at the Southdale Community Centre, 254 Lakewood Boulevard, which is actually not that far from me. This is on the CP Emerson subdivision and I understand they will proceed from the yard to that location, then back up into the CP yard again after the show, since they'll head to Thunder Bay next. Complete schedule here. For opportunities like this, it is very important to plan ahead to maximize your photo opportunities, visualize what photos you want, and plan how to get them! Realistically I would only be able to catch it somewhere between Portage la Prairie and Winnipeg, and honestly it would be between Marquette and Winnipeg, a stretch of some 16 miles. It's open terrain and with some luck you might be able to get it twice. The trick is knowing when it is coming into Winnipeg. 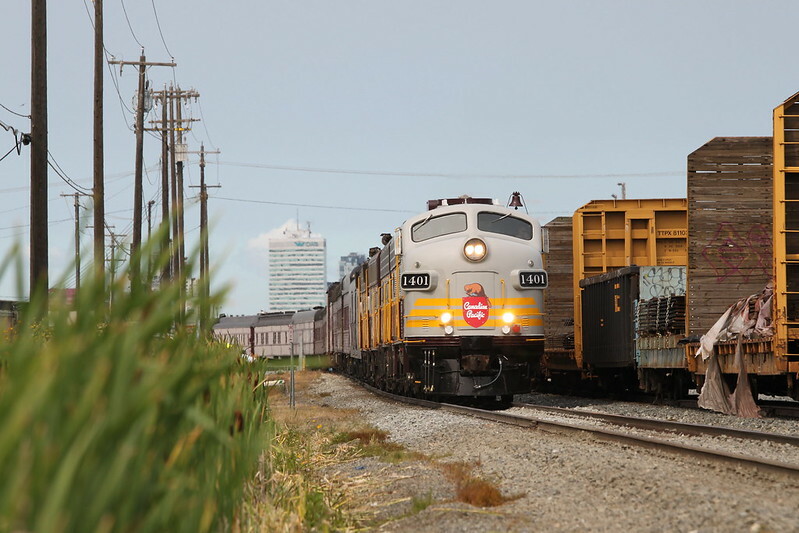 Hopefully railfans will be posting on the RailsMBSK Facebook group so we can get some clues. I know there have been a lot of reports as it has traveled through BC and Alberta and now into Saskatchewan. I may or may not be able to catch it on the way in. Likely this will be done mid-afternoon on August 4 to position it for 5 PM. Looking at Google Maps, I think the best shot would be at Point Douglas crossing the Red River. That would be a nice photo and the light would be pretty good. Failing that, by the former Central Grain on Archibald would be decent as would a couple of other spots along Archibald. I'm not going to do this as I have other plans for Friday afternoon. Photographing the train during the show would be great to catch the crowd and the vibe, and to enjoy the music and performances. It's probably not prime railfan photo time but I think it would be important to include the crowds in the photo to give a sense of the occasion. I will try to be there but I will certainly miss the first part of the performance. The same locations I mentioned above will work but it'll be close to sunset, so I would say the bridge shot would be killer if the sun was still giving enough light. They certainly won't be backing up very fast so chasing it would be easier. If they left in the morning, that would be great as you would have light on the nose of the train. I would be tempted to go out Deacon Road / highway 207 to here and walk over to photograph them crossing the Floodway. It's wide open and there's a rise you can stand on to get the whole train. You can't chase them on the Keewatin as there aren't any parallel roads. I guess if you were really ambitious you could go farther east into the Whiteshell or into Ontario but I am not that ambitious. Again the question is when they will leave Winnipeg. What do you think? Where are the good shots? Do you plan on seeing it if it is coming your way? (consult their schedule) Have you seen it already? Comment below. PS thanks to BCR_766 and David Gray for posting photos to Flickr! I'm going to try and catch it between Reaburn and Rosser, but I'll need some heads up about when it's coming. I'm not on facebook. A great place for a pace video is the ten miles between Marquette and the Rosser curves. And then the other five miles from Rosser to the perimeter. Hi Bill, I guess they added a unit later! 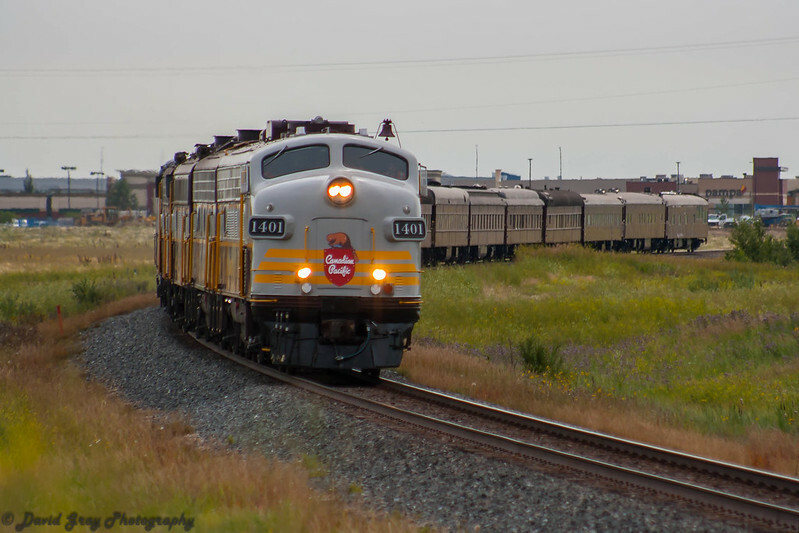 I see they had 4106 as fourth unit leaving Edmonton. I am going to go to Portage in the morning, get them there, and then chase east and hopefully beat them to Rosser. We'll see what happens I guess. Good idea for a post. Might need to make one up about my day. 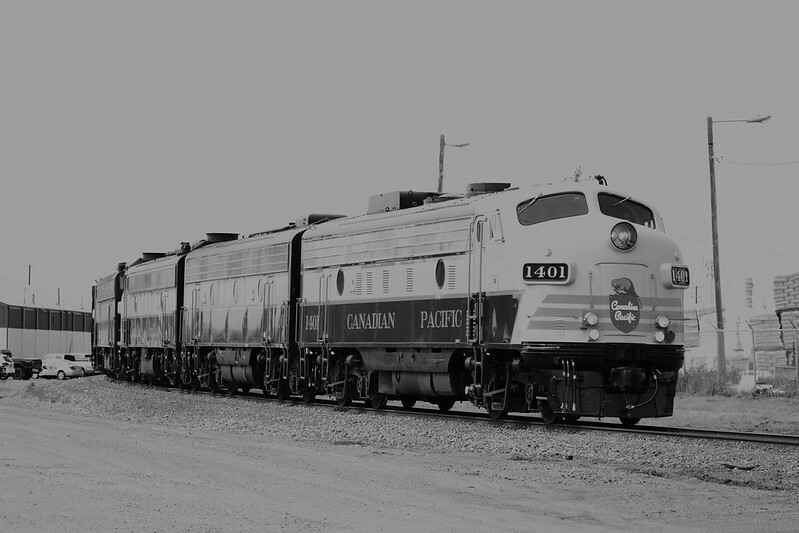 As for the fourth unit, 4106 was brought on at Revelstoke as another unit was having issues. Hope to see you at the show, Steve! Looks like we'll have a nice evening on Friday (knock on wood) to take in some of that F-unit class. I was thinking of shooting him passing the CPR station on his way back to the yard after the show. BUT that can be a sketchy area as the sun sets; so it's either that shot or a silhouette shot of the train crossing the Red River. Not settled on one yet... decisions, decisions! I'm looking forward to this shoot and seeing everyone's pics from the show in Winnipeg!